SolarLEAP is committed to bringing computer technology to students and consumers in the developing world as inexpensively as possible. By donating to SolarLEAP, you are not only funding our unique solar-powered desktop computers, you are enabling the the installation of those computers in schools around the world. Each computer costs approximately US$499 to deliver and install in a school. 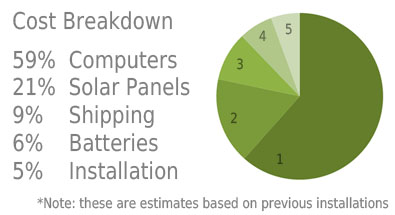 This includes the cost of the computer, the roof-mounted photovoltaic solar panel, 12V DC battery, wiring, and installation costs. Grassroots donations are crucial to SolarLEAP's success. Even small donations are important to us. You can sponsor a computer, a solar panel, or even the installation cost of an entire lab computer lab -- a donation of any size will go directly to helping students in developing countries gain access to information technology. We currently can accept tax-deductible donations in Hong Kong (please email cpw@solarleap.org for information), and are working on getting 501(c)3 status in the United States. Additionally, if your company has a matching program, you can significantly increase the impact of your donation! For information on other ways to donate, or if you have trouble with the PayPal form, please email cpw@solarleap.org. Partner with SolarLEAP for a mutually beneficial relationship. If you are a representative of a non-governmental organization working in education, solar power, alternative energy, rural poverty relief or technology, partnering with SolarLEAP can benefit you in many ways. Please email ngo@solarleap.org for more information on how we work with other non-profits! SolarLEAP can also provide our unique solar-powered computer lab concept on a project-by-project basis. If you represent a family foundation or corporate social responsibility department looking to make a high impact donation targeted to a specific area, we can work with you on a project basis. This includes everything from planning to organizing the shipment to on-the-ground installation. Alternatively, if you don't have a specific region in mind, we are always finding new schools in need of a sponsorship! Contact project@solarleap.org for more details.